Note: This post is amended from the original, thanks to the research of reader Ed, who has a knack for ferreting out much-needed information. 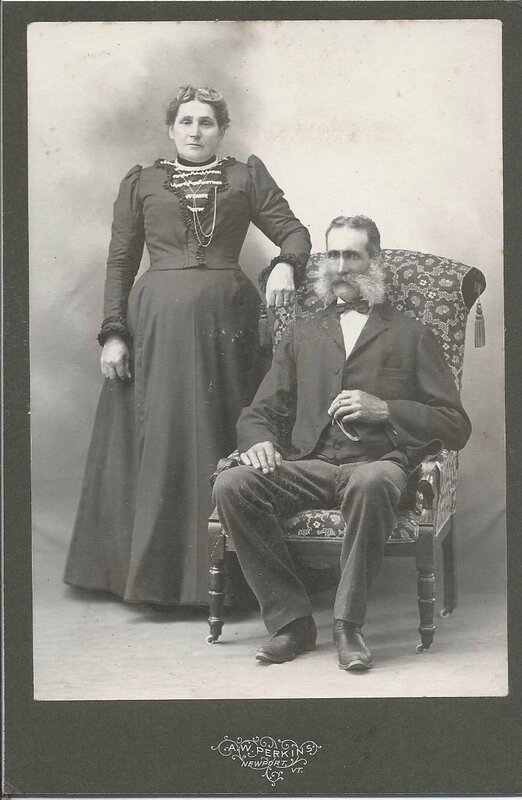 Photograph of a middle-aged couple taken by the A. W. Perkins studio at Newport, Vermont. The husband was a very handsome man who apparently took great pride in his mustache and sideburns. Text on the reverse, which I accidentally defaced, but thankfully not before having written it down: "Bozalis Vanier, 2nd Husband. First husband was Allaire, who was Father of Melina Allaire." Bozalis was likely Marie Basilice [variant spellings] Renaud, daughter of Levi and Marie Ann (Lague) Renaud of Quebec. She was born in July 1847 at Waterloo, Quebec. Her first husband, whom she married in 1866, was Denys Joseph Goyette Allaire, son of Joseph and Sophie (Goyette) Allaire. As noted on the reverse of the photograph, one of their children was Melina M. Allaire, born 19 May 1872 at Stukely, Quebec. About 1895 Melina married Jerry D. Hill, son of John and Louise (Duchesne) Hill. Jerry was born 9 March 1867 at Vermont. I believe Melina and Jerry had seven children, whom they raised in Orleans County, Vermont. Denys and Basilice (Renaud) Allaire had at least one other child, son Napoleon Denis Renaud Allaire, born about August 1867/68. Denis Joseph Goyette Allaire died before 1875. About 1875, Denis' widow Marie Basilice (Renaud) Allaire married Zepherin Vanier. His first name appears in many forms: Zephyr, Zephyr, Zepherin, Zephrin, etc.. He was born 22 September 1837 at Montreal, Quebec, the son of Basil and Marie Josephte (Leonard) Varnier. Zepherin's first wife was Marie Odile Miron, born or baptised 18 June 1844 at Montreal, Quebec, daughter of Zephrin and Leocadie (Desrosiers) Miron. Marie Odile and Zepherin Vanier married in 12 September 1864 at Montreal at the Basilica Notre-Dame. I don't have Marie Odile's date of death, but I assume she died before 1875. Zepherin and Marie Basilice had children from their previous marriages and went on to have children of their own. Zepherin died in 1918. I lost track of Marie Basilice (Renaud) Allaire Vanier after the 1920 Census of Newport, Vermont. If you have corrections to the information above and/or clarifying information, please leave a comment or contact me directly. Try this lady, who might be really named Beauselice or something like that. Here she is with her second husband Zephyr Vanier. Someone needs to do some French phonetics to figure out what his name really is. I don't have time to work it all out. Her first marriage, to Mr Allaire, would be in Canada, I think. I haven't really compared all the dates yet. she was 64, both were married twice, this time for 35 yrs. She had 8 children, 8 alive. Says she arrived 1877. First marriage would have been when she was 29, which matches her 1900 information. Might be in Canada. Marie Malvina Allaire, baptized 24 May? 1872, Ste-Anne-de-Stukely, Québec, born 19 May? 1872, of the legitimate marriage of Denis Allaire, cultivator, and of Baselisse Renaud of this parish. Thanks to your first comment, I got on the right track and now have enough to revamp the post, with due credit to you, Ed. I hadn't tracked down Zephre's first wife yet, so you've now made that easier for me, too, with your second comment. Thanks so much! Thank you for the informations on this site, it help me conplete my site for Basilice Renaud. Bruno, it's wonderful to hear from you! Lots of good information on your site, including the French-English glossary of genealogical terms. All of my information comes from online research, and there are likely to be some errors, but I believe the information on Basilice comes mostly from Drouin records, after Ed got me on the right track. As for Zephirin, I don't have any more information on him than you, but, as a strikingly handsome man, he must have cut quite a figure in town!